It is nice to see former Angel Bartolo Colon having early success with the New York Yankees - just because it seems so improbable for someone of his age and his body type to give a Major League team a shot in the arm long past his prime. When Colon was still with an Angels, watching this TV show about his life and his professional career made me see him differently - as opposed to just another Major League pitcher who may not have deserved to win the 2005 American League Cy Young Award, who really had an up-and-down career with the Angels after signing a big free agent contract. With the 'experimental' procedure done on Colon, we might not really know what it took to get him back to a level where he can go out and pitch effectively - hopefully the wheels won't fall off anytime soon and after going AWOL in each of his last two stints with Major League teams, he'll be able to stick around for the entirety of the 2011 MLB season. 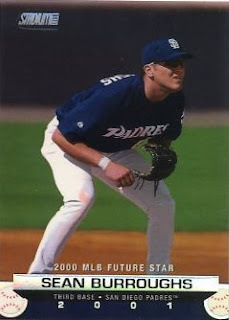 Russell Branyan was a super prospect with the Cleveland Indians about a decade ago and while not quite fulfilling his potential - he has carved out a journeyman career in the Major Leagues as an all-or-nothing power hitter with some ability to take a walk. I don't know if a 36-year old is the answer but given the lack of pop in the Angels' lineup - the Angels have given Branyan a chance to show that he isn't completely done as a big leaguer. Branyan has been a castoff, a role player, a bat off the bench - he's a Matt Stairs type who probably doesn't need to be played every day and is ultimately expendable if he doesn't produce. If Branyan does split time with Mark Trumbo at first base - it might go against the grain of letting Trumbo figure things out as a relatively young guy playing regularly. Having Branyan around however may give the Angels an opportunity to put Trumbo in situations where he is going to have success - Trumbo does look like a guy who can hit 25-30 home runs a year, but maybe the expectations of him being the next great slugger may not be realistic when his on-base percentage is sitting at .290 as of May 28. Former Angels relief pitcher Dewayne Buice was at Monday's Angels-Oakland A's game and I got him on a 2011 Angels pocket sked - after another collector had spotted Buice and had him sign a bunch of cards this collector carries around, in case any of the 'old timers' show up. I have Buice's cards in my Angels alumni binder, but I don't bother to bring those cards anymore, so I was kind of out of luck - if I don't see Buice anytime soon with my several late 1980s cards in-hand to be signed, at least I can say I already got his autograph for my Angels' collection. I don't know if the 2011 version of the Cleveland Indians are going to be a first-half wonder or if they are going to continue to stick around the top of the AL Central - I compare the Indians team to the 1995 Angels, which finished the season 78-67 in the AL West. After not really knowing what you are going to get from the Angels in previous years - the team started to come together in 1995 with a mix of some young talent and older veterans. The 1995 Angels had traded for Tony Phillips early that season - while the Angels lost an undersized but gritty outfielder in Chad Curtis, Phillips was the Angels' lightning rod at the top of the lineup. While the Angels ultimately suffered a late-season collapse that was painful to watch - Phillips played in 139 games for the 1995 Angels he slugged 26 home runs, walked 113 times, scored 119 times and had a .394 on-base percentage. After spending the 1996 season with the Chicago White Sox, Phillips was picked back up by the Angels during the 1997 season - he would end his final Halos stint under dubious circumstances after being arrested for trying to buy some free base cocaine. Phillips threw out the first pitch before Monday's Angels-Oakland A's game and I was able to get his autograph [on the 1995 Fleer Flair pictured] - after he visited with players / coaches on the field during batting practice. I got him on a second Angels card [1996 Topps] - when he actually made his official appearance to sign autographs on the concourse behind the rocks in center field. I picked up a small eight card lot of 2011 Topps Gypsy Queen inserts for about $5 shipped - I wasn't familiar with the product when I found the lot and assumed the regular sized inserts would be of the 'framed paper' variety, like the green framed Target parallel of Hunter Pence [#77]. There were two Wall Climber inserts in the lot - Michael Brantley [#WC 8] and Rajai Davis [#WC 5]. This Clay Buchholz [#309, mini Gypsy Queen red back] was one of the two mini cards in my lot - the other was Roy Campanella [#237]. I was disappointed when I found out none of the inserts - had the 'framed paper' treatment. #BP 93 Brandon Belt - proved not quite ready for the Major Leagues, but is scorching the ball in AAA. #BCP 95 Addison Reed - some denting on the top of the card. I was trolling for any 2011 Bowman at Target / Walmart / Toys R' Us during the past week and found bupkis so far - I just hope retail isn't going to dry up before the stuff even hits the shelves like 2010 bowman seemingly did. I don't know if I'd consider myself fortunate after my breaks, but I was able to secure my cardboard crack fix at an unspecified retail shop - I was like a zombie, with everything happening so fast, I paid my money and was in and out in a span of five minutes. I had about five jumbo packs [32 cards per pack] of 2011 Bowman in-hand and ripped as fast as I could before heading to work on Wednesday afternoon - unfortunately, it is feast or famine if you are only looking for that one guy everyone is going apesheet about. Yes, I'm looking for the same dude but unfortunately - I will say I didn't pull a single base, a Bowman Chrome or any insert of Bryce Harper. Pack one - I ripped from the back and Bowman's Best insert was staring towards me in each of the five packs. #BBP 7 Mike Moustakas - Bowman's Best insert; I couldn't say what the difference is between these inserts and the original 1994 Bowman's Best cards and it honestly shouldn't matter. These cards are pretty nice. Harmon Killebrew passed away on May 17 - less than a week after announcing he would giving up his battle against cancer. I'm not sure if I had my picture taken with him but I was able to get his autographs at a golf tournament five or six years ago - one of the cards I was still hoping to get signed was his 2002 Donruss Originals card, which modeled after the 1984 Donruss design, featuring a black and white image of Killebrew. Besides slugging 573 home runs in his career and receiving various accolades as a Hall of Fame legend - maybe an interesting aspect about Killebrew's career was getting to the Major Leagues at 18 as a bonus baby. For parts of the next five years, Killebrew seemingly made token contributions for the Minnesota Twins - until finally getting an opportunity to play every day as a 23-year old in 1959. I don't follow his playing career as closely, but it is nice to see former Angels first baseman Casey Kotchman enjoy some early success with the Tampa Bay Rays in 2011 - he was the blue chip prospect out of the Angels system in the mid 2000s, expected to be some sort of Mark Grace / Keith Hernandez hybrid. 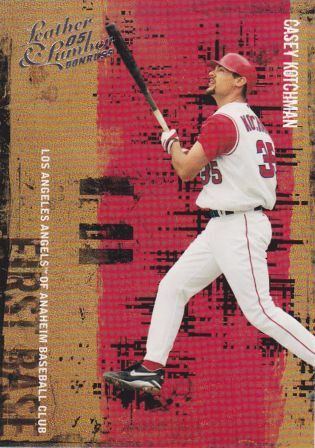 However illness dragged down his first few years with the Angels and inability to hit for power made him an expendable player - these days Kotchman looks more like Dave Magadan rather than an All-Star first baseman, but an off-season operation has cleared his vision and it looks like he is hitting for average again. Injuries have derailed Adam Miller's professional career and while the Cleveland Indians are still trying to get something out of the first round pick - making a living as a professional baseball player has been a painful experience for Miller. Brandon Wood may still carve out an decent Major League career at 26, but he's got a lot of work to do - I still kind of hope he finds success, even though he isn't an Angel anymore, just because it would really be a waste if his once prodigious potential translates into nothing but MLB futility. As an Angels fan, I don't know what to think about Jeff Mathis - he has played in parts of seven seasons in the Major Leagues and has a lifetime batting average is .199. What position player hits .199 for their Major League career - maybe there was once hope that the 28-year old Mathis would do so much better with the bat once he was given an opportunity to play every day, but it hasn't happened yet. I'd labeled him as merely a disappointment because he has stuck around with the Halos all these years - but his toothpick bat is just too hard to ignore otherwise. Clint Everts was the No. 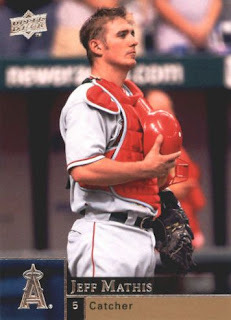 5 overall pick in the 2002 MLB June Amateur Draft - he was supposed to be something good for the Montreal Expos years ago but hasn't played in the Major Leagues with any team. Everts is just one of many examples that shows why there is no such thing as a pitching prospect - they can be held in such high regard coming from the amateur ranks, through the minors, but their next pitch could be their last. Adam Piatt was an up-and-coming prospect for the Oakland Athletics at the end of the 1990s and made his Major League debut in 2000 - as he was trying to establish himself with the A's, I remember some kind of illness bogged him down, besides not really being that good in the first place. After his MLB career was done, he was mentioned in Mitchell report, featuring 'who's who' of professional baseball players - who have been supposedly been associated with PED use. In 2009, it looks Piatt got into a scuffle with the law - his mugshot is featured on this Web site. 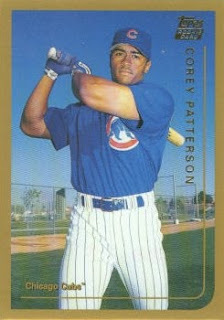 Corey Patterson was supposed to be a poor man's Barry Bonds coming through the minors, though Patterson's No. 1 problem - was not being able to sustain the ability to get on-base when he wasn't getting hits left and right. A bust of a top prospect, his journeyman career may not be unique - but he has been productive in small spurts [even with a .293 lifetime on-base percentage] and shown flashes of the talent that at least keeps earning him a MLB paycheck. 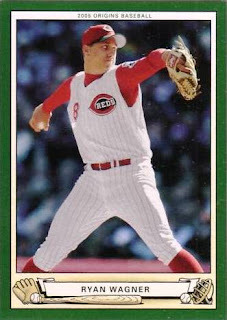 I don't know what to say about Ryan Wagner, a college relief ace whose professional career came up quite short of expectations - he never developed into closer material and whileh he played in parts of five years in the Major Leagues, his last full season was in 2005 when he posted a 6.11 ERA in 42 games. From Little League World Series star in the early 1990s to uber prospect for the San Diego Padres in the early 2000s, Sean Burroughs was supposed to be the real deal - he settled into the Major Leagues for a couple of years but his lack of power was apparently disappointing and his last MLB season was in 2006. The son of 1974 American League MVP Jeff Burroughs - I think there was more to why Sean couldn't stick in the Major Leagues, even as a guy who wasn't going to be play everyday because of the lack of power. Sean is back in professional baseball and is currently playing for the AAA Reno Aces in the Arizona Diamondbacks system - reading this story about his comeback this season, it sort of goes into the reasons why his playing career sort of floundered. My friend and I went to a California League game this past Sunday [Visalia Rawhide at Inland Empire] and got former MLB pitcher and current Visalia Rawhide pitching coach Doug Drabek's autograph - he won a Cy Young in 1990 when the Pittsburgh Pirates were actually pretty good for a stretch in the early 90s. Doug is also the father of current Toronto Blue Jays pitcher Kyle Drabek - he has always been a good signer through the mail and in-person, though personalized everything sent through his mailing address. The one card I wasn't sure about getting signed Sunday afternoon was a 1995 Topps Embossed - the card has an embossed, foil effect and I wasn't sure if the card was going to take the Sharpie well. I don't particularly like the card but I think it stands out and did present somewhat of a challenge to possibly be autographed - fortunately as one of several cards Doug signed for me, it came out just fine and my needless worries about getting a 16-year old card worth about a nickel was unfounded. 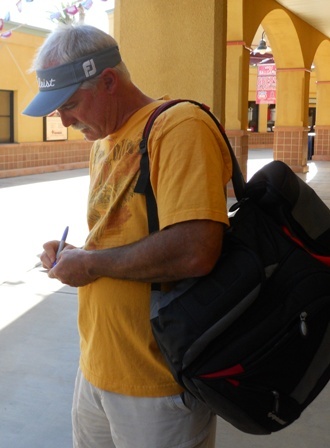 I took a picture of Doug signing on the concourse when he finally came out of the clubhouse after the game - the coaches from Visalia must have taken an hour or so after the game to kick back after a 17-2 whipping of Inland Empire. FYI - on Monday, they only scored one run in a 7-1 defeat against the same team. I received a 2011 Atlanta Braves factory team set from a blog contest by being closest to guess Atlanta Braves pitcher Julio Teheran's pitching line in his Major League Debut - I don't usually pay attention to these factory team sets because even with the minor modifications made to make the cards different from the flagship versions, these team sets seem redundant. However, with a rookie like Freddie Freeman [who does have a card in Topps Series I] - a different image used means a new variation of his official MLBPA rookie logo card to chase, even though these team sets are not that too difficult to find. Topps should do its part to slip in a rookie or two in these team sets - to make them just a little bit more than just another baseball card souvenir to pick up at a retail outlet or stadium. 2011 Topps Gypsy Queen blaster [$19.99 at a Target] - I was hoping to get lucky looking for retail 2011 Bowman which came out in the last two days, but didn't find any. However, I found a lone blaster box of Gypsy Queen and decided to pick it up since it has been out for about two weeks - but I hadn't seen any of the cards in-hand. #58 Dale Murphy - my memories of Murphy are tied through his baseball cards of the early 1990s, so I really only remember him as the longtime veteran probably five years past his prime. Decoy card - the thick white filler variety sometimes I'd use to get someone's autograph on. 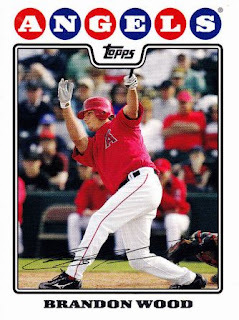 #176 Kendrys Morales - will he ever wear the Angels' uniform again or is he done as a Halo? #GQ-15 Lavenia, Praha - Gypsy Queen insert; it is a little creepy not knowing who these gypsies are, even though they maybe just ordinary women featured as 'props' Topps hired, dressed up and photographed to enhance the overall theme of the set. Judging from a small sample size of cards pulled from a blaster, maybe I was hoping for something a little more to jump out at me - to make the images on the cards really stand out and to give the cards a different feeling in-hand, perhaps the themed inserts should have been 'framed' like the 'framed paper' parallels. I really want an opportunity to bust any 2011 Bowman [unlike 2010 Bowman, which was a ghost as far as availability was concerned] - so unless I really can't find any 2011 Bowman, my interest in Gypsy Queen probably stop and ends with this blaster. Once traded for Drew Henson, Pena is still young enough that he should get another opportunity to play in the Major Leagues - or at least in end up in Japan to put up some video game numbers. He's playing for the Arizona Diamondbacks AAA team in Reno and so far in 2011 - he is hitting .366 with a slugging percentage of .777 and an on-base percentage of .429 in 112 official at-bats. I think there is some curiosity with professional athletes who never quite to get to the top - especially when you had a 'physical specimen' like Wily Mo, who would have been labeled a 'toolsy' player with lots of work to do besides just show up ready to play. I just had a handful of Pena's early cards during his prospect days with the New York Yankes and was hoping he'd turn out to be Sammy Sosa lite - unfortunately, he turned out to be Frankenstein's monster. Wily Mo got a chance to play in the Major Leagues from the mid 2000s but it seemed like there were some issues in just letting the guy play - maybe it was lack of conditioning, maybe it was lack of baseball aptitude and just inability to put it together, but he kind of washed out of the Major Leagues two or three years ago. I was digging out some of the random game used cards I had and came across a 2002 Upper Deck Rookie Edition Future Watch uniform card of Quentin - I'd put this 2006 Upper Deck Update card together with the uniform card as a companion. I liked the Upper Deck Update card as sort of an early card of Quentin that wasn't really a rookie - since his first-year cards came out in 2004 and he had a few USA cards perhaps. Quentin has sort of had an up-and-down Major League career just because of the various injuries he has suffered - if healthy, can carry a team for two or three weeks at a time. It is ironic I've been kind of glancing at the two Quentin cards the past few days, thinking he's been kind of a disappointing, almost middling playing - and BOOM, he goes off with a 3-for-4 night in an 8-0 win against my home team Angels Monday night. Quentin hit a home run, two doubles and picked up five RBI - maybe if he isn't playing against the Angels, he'd been a fun guy to watch otherwise.